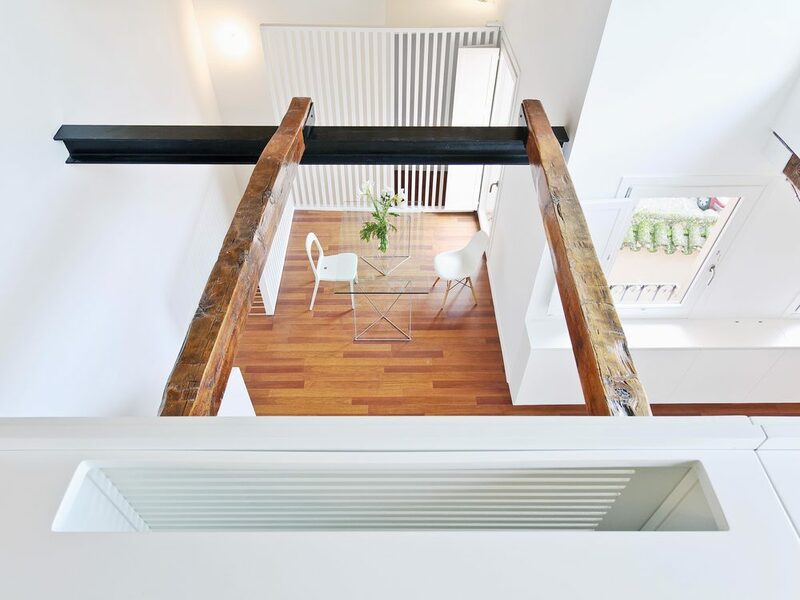 RENOVATION AND REFURBISHMENT IN AN EIGHTEENTH CENTURY BUILDING IN THE HISTORIC CENTER OF TOLEDO IN SPAIN. Reconstruction and renovation of a house - in the historical city of Toledo. 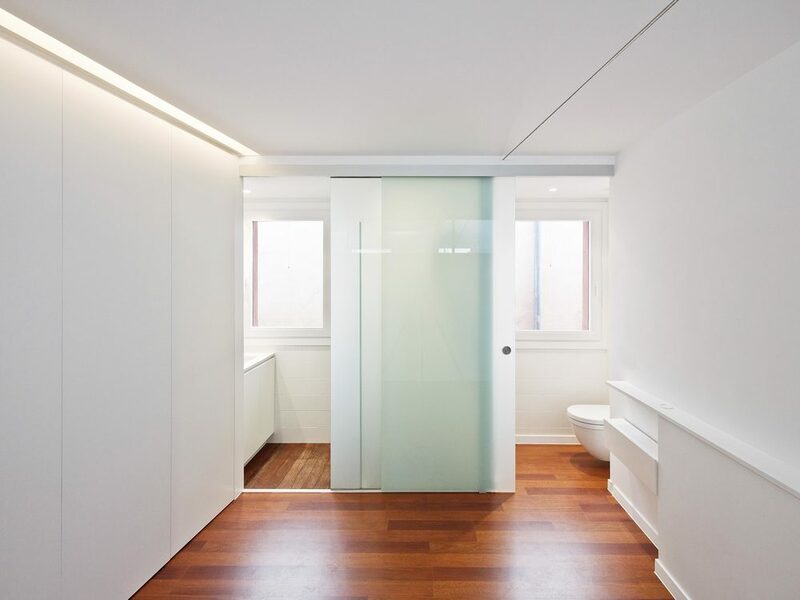 The project was a house from the Baroque period (mid-eighteenth century) situated in the medieval town of Toledo, with narrow streets that allow a particularly low level of natural light to reach the houses. The house is part of an unusual former patio house configuration, since only three sides are surrounded by building, with a very few windows. The traditional patio house of Toledo broadly follows the traditional model of a typical Mediterranean house, of old Roman origin, which has been preserved through the Middle Ages. The main characteristic is the central patio, around which the rooms in the home are located. These rooms receive light and ventilation through the yard due to the small size of the surrounding streets. In this particular house, this patio was close to a public area, and the house itself lacked sufficient windows to cover the actual requirements of lighting and ventilation. The overall aim of the project was the complete renovation of the house with two main objectives. The first was to utilize all available space and maximise the use of natural light through high quality architecture. Secondly, the project aimed to renovate key existing elements of the property to maintain the intrinsic architectural qualities of the building in its historical context. We attempted a careful restoration that minimised disruption to the local built environment, and thereby helped to protect the historical urban spaces without giving up any modern aspects of living that are available today. The house consisted of two parts: one of about 70 square meters located on the second floor of the building (this one was the former house – it was very dark and divided into various small rooms) and a small storage room located on the first floor of the building. Both parts of the house were linked by a private outdoor staircase. The original external walls, half a foot thick, had a wooden structural frame and masonry. Inside the house, there were two main objectives. 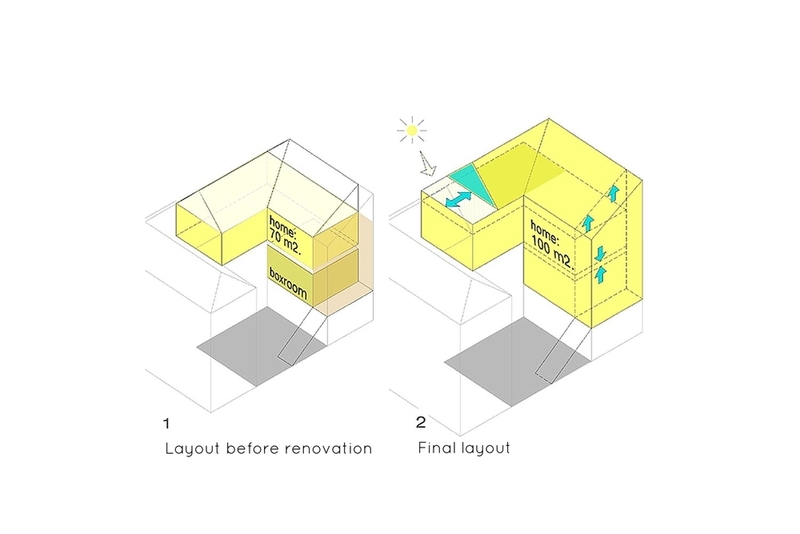 The first objective was to make available the maximum amount of living space while complying with the strict planning regulations of the local Government and the restricted budget. The second objective was to introduce as much natural light as possible. The first objective was achieved by joining the boxroom and the outdoor staircase to the main part of the home. Also, the roof was fully disassembled, restored and re-built one meter higher to create a space under the roof. Rehabilitación de una vivienda del siglo XVIII en el centro histórico de Toledo. Por un lado, conseguir la mayor cantidad de superficie habitable permitida (dentro de la estricta normativa urbanística de Toledo y del ajustado presupuesto) y, por otro lado, introducir la mayor cantidad de luz natural posible. El primero se consigue incorporando el antiguo espacio destinado a trastero, situado en la planta primera, y también la escalera de acceso a la vivienda. Además se añade el espacio bajo-cubierta (desmontando la cubierta completamente, restaurándola y construyéndola de nuevo 1 metro más elevada, según proyecto). El segundo, dado que los huecos de fachada no se pueden modificar según normativa vigente, se consigue a través de una nueva terraza interior, realizada en el plano de cubierta, a la que se accede mediante un gran ventanal orientado a norte.